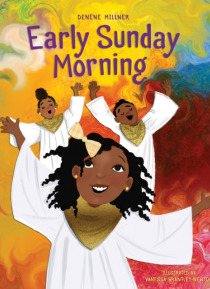 Early Sunday Morning is the first offering from Denene Millner Books, the new childrens line published under Agates Bolden imprint in partnership with Denene Millner, the noted parenting authority, editor, and New York Times bestselling author.Love and family. These are the things that a little girl finds most special about Sunday mornings. Early Sunday Morning follows June, Mommy, Daddy, and brot… her Troy through their weekend routine as June prepares for a special performance leading the childrens choir at church on Sunday morning.Readers spend the weekend with June as she collects helpful pieces of advice on how to be less nervous about her big solo. Along the way, she visits the barbershop with Mommy and Troy, gets her hair done by Mommy, receives a special dress from her aunt, and shares her family ritual of getting ready for Sunday morning service. As her special moment approaches, June leans on the support of her whole family, as well as advice from her father, to conquer her fear of singing in front of the congregation.Early Sunday Morning is a heartwarming celebration of the special time a young girl and her family share together as she learns how to lift her mighty voice.